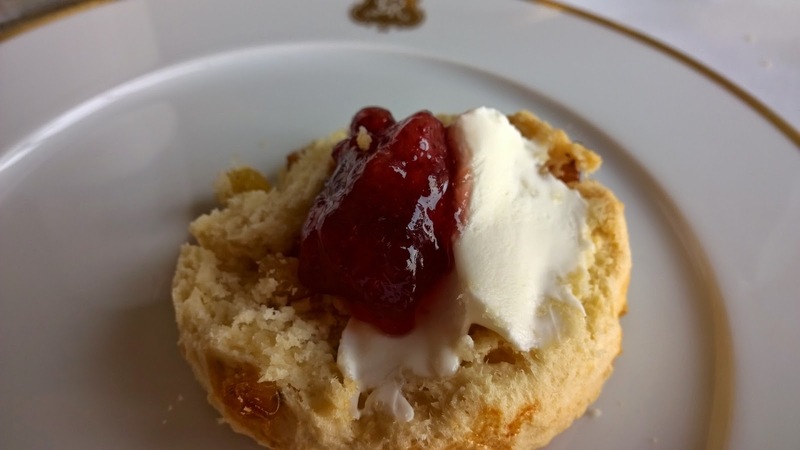 The story of Afternoon Tea is known to all those who enjoy this ritual - Anna, the 7th Duchess of Bedford, felt that a meal was missing in her day. She requested tea and a few light snacks to be served between lunch and her evening meal. It became immensely popular. Hence this tradition, loosely speaking, was born. However, St Regis added its own bit of history to this. Caroline Astor, the mother of the founder of the first St Regis in New York, JJ Astor IV, popularized this tradition stateside as she hosted soirées for the social elite in New York. 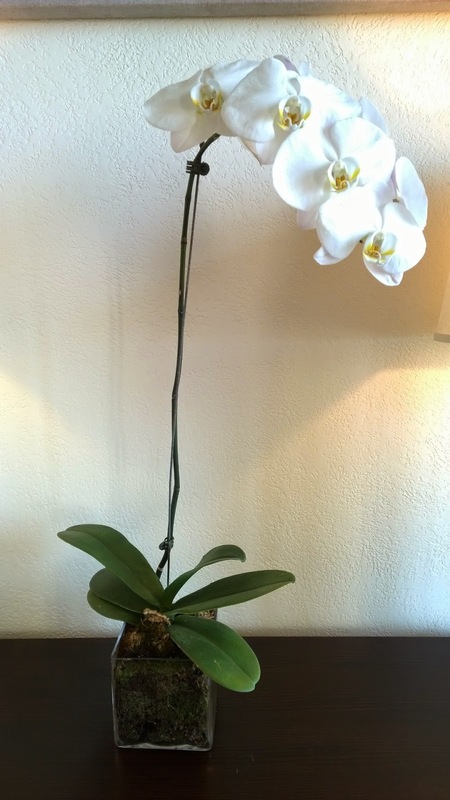 So, from something born out of necessity, it grew in status a social event. 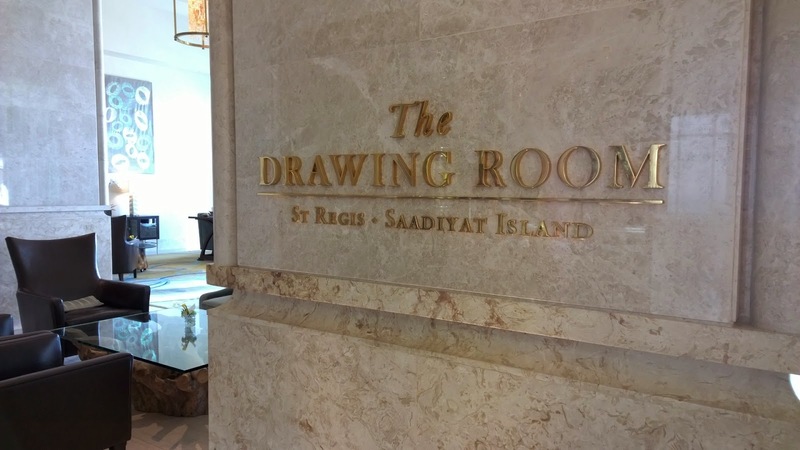 Appropriately, St Regis Saadiyat has a Drawing Room, recalling the English tradition of having a room for 'withdrawing with a guest or two and having a private drink or snack. 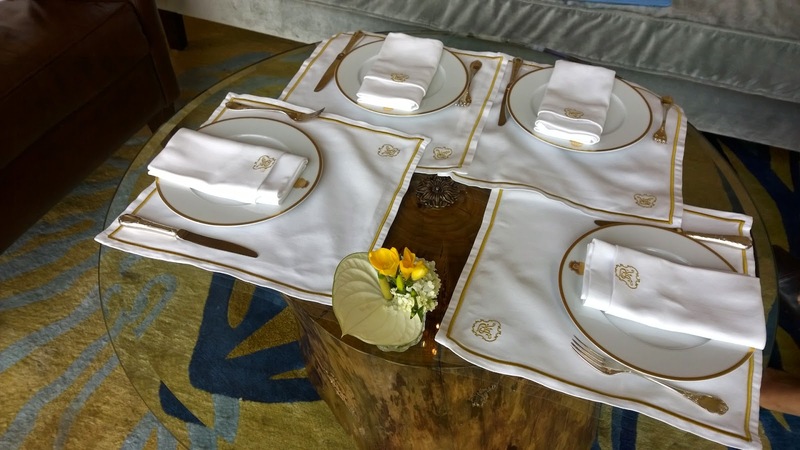 With all of this history, it is easy to see why the St. Regis Afternoon Tea is something, at least on paper, that is special. I visited The Drawing Room to see if it translated well into reality. 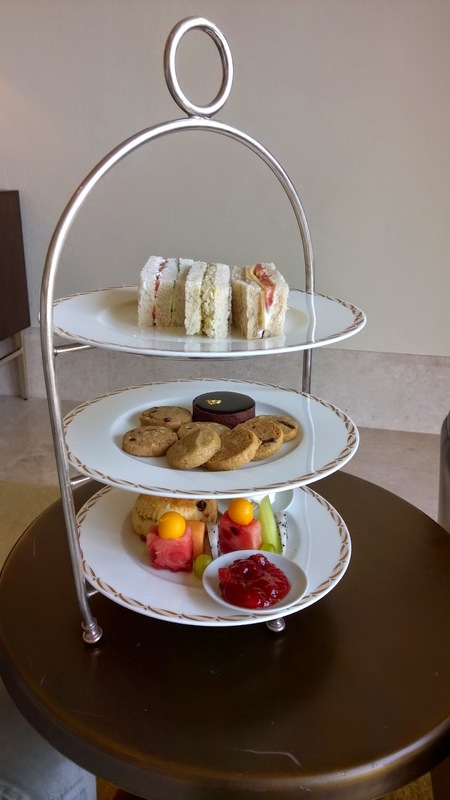 With it being the current 'Best AfternoonTea in Abu Dhabi' courtesy of Timeout Magazine, I had added curiosity. The Drawing Room has a stately but relaxed feel. As we are seated at the window, the ocean view is mesmerizing. The turquoise colour of the water is so captivating, as is watching the breaking waves. True to the original St. Regis with its Jazz influence, I can hear Sarah Vaughn's "You stepped out of a dream". Well, sorry Ms Vaughn, but for me it was like stepping in to a dream. Our table at the oversized windows gives us privacy to the point where it really feels like being in one's own Drawing Room. The world around does not exist for me. 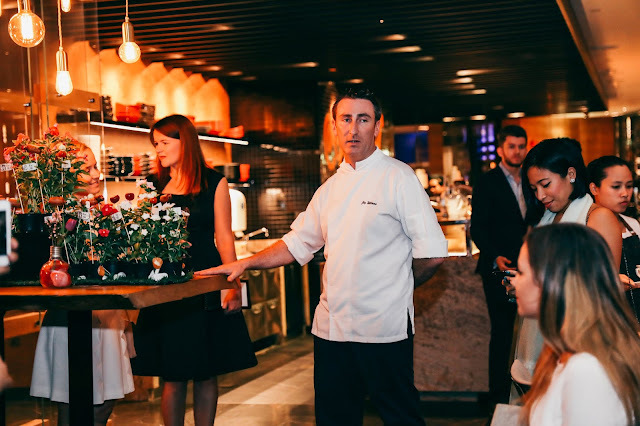 A menu that makes you feel Afternoon Tea is a ritual that is highly regarded. 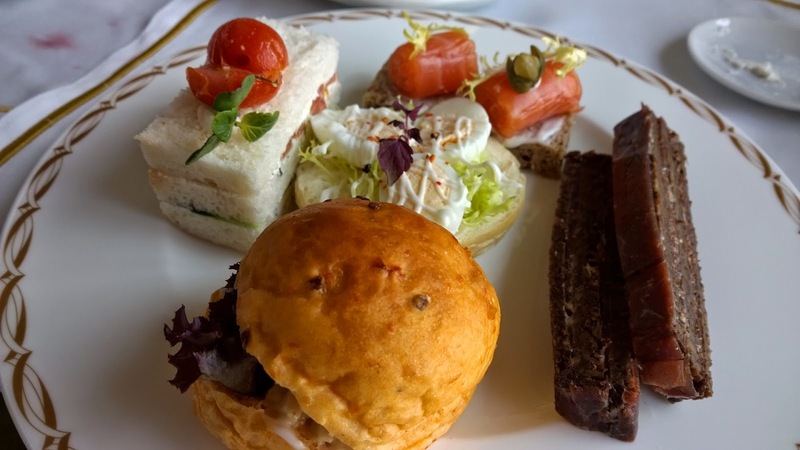 The esteem in which Afternoon Tea is held is manifested in the menu - a beautiful hard cover menu that takes one through the a la carte options, afternoon tea options and selection of teas. 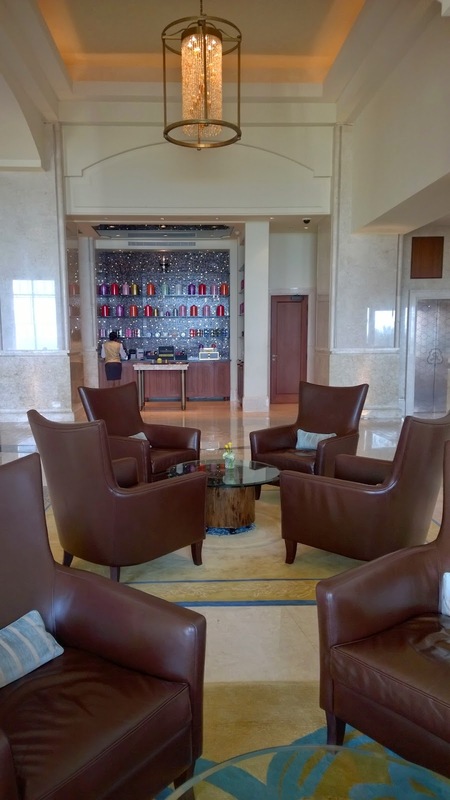 There is basically one choice - The St Regis. I like this. 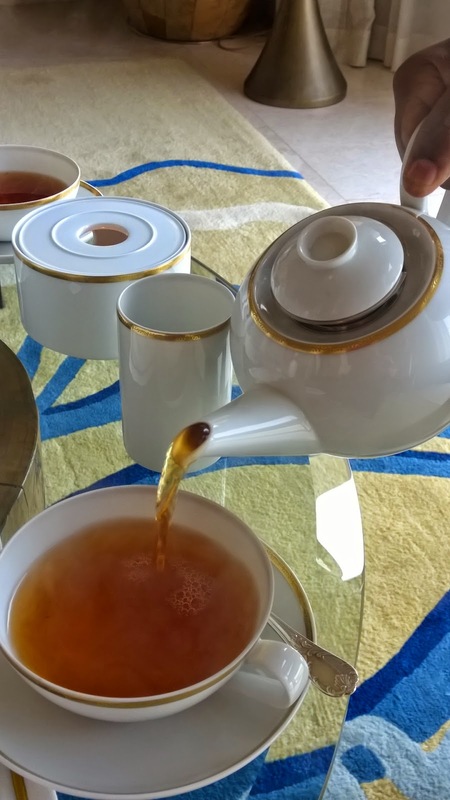 Afternoon tea is about tradition, not about adapting to market forces. I am occasionally fascinated by hotels who offer 3 or 4 different afternoon tea sets. It is a good gesture on the surface, but it does not put faith in tradition. 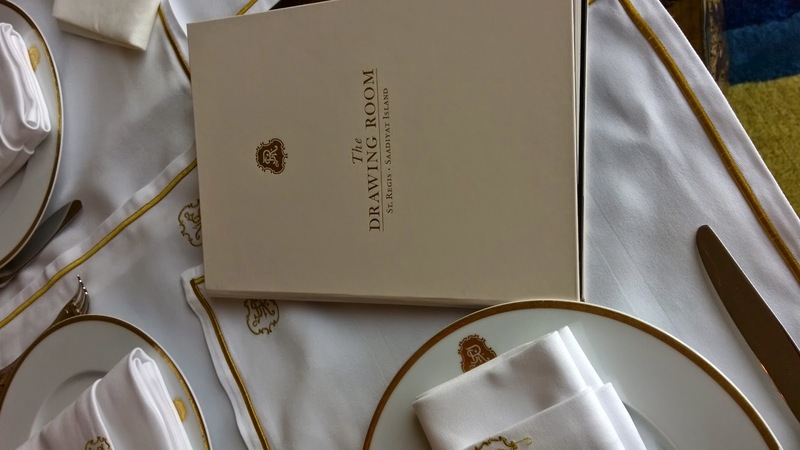 The Drawing Room's statement is all about respecting tradition and trusting that guests can appreciate that tradition as well. In keeping with a growing custom though, it offers a glass of bubbly as an optional extra. 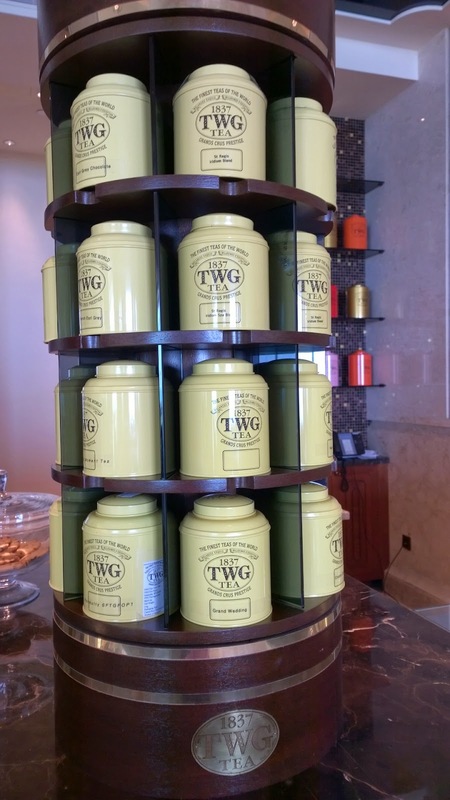 TWG offers an incredibly wide selection of tea. 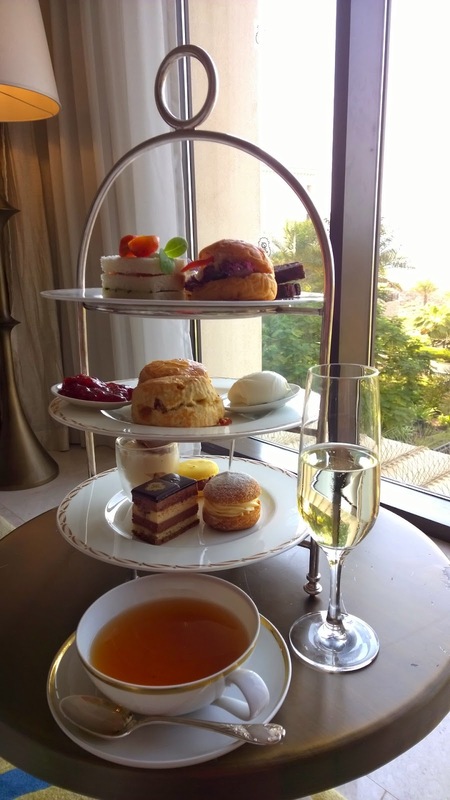 We order the St. Regis Afternoon Tea and a glass of bubbly for me. It is at this point that I continue to be impressed. Firstly, there is a Children's Afternoon Tea as well, something of a novelty in the city. And why shouldn't there be a set for children? I encourage my daughter to dress up for Afternoon Tea to emphasize how special it is, so it is fitting that as a child she could be acknowledged in this way. Nice. Secondly, TWG, the Singapore based Tea Company is the tea on offer and the menu offers some enchanting options. In anticipation of the serving of the set, my bubbly is poured. It is a Villa Sandi Valdobbiadene Prosecco. My daughter, who has been joined by her friend for the afternoon, gets her milkshake as part of the children's set. For my tea, I have South African rooibos infused with French spices. I cannot help but notice the Furstenberg china by Sieger and the Christofle silver. Again, small indicators of an Afternoon tea where careful thought has gone into everything to elevate the experience. 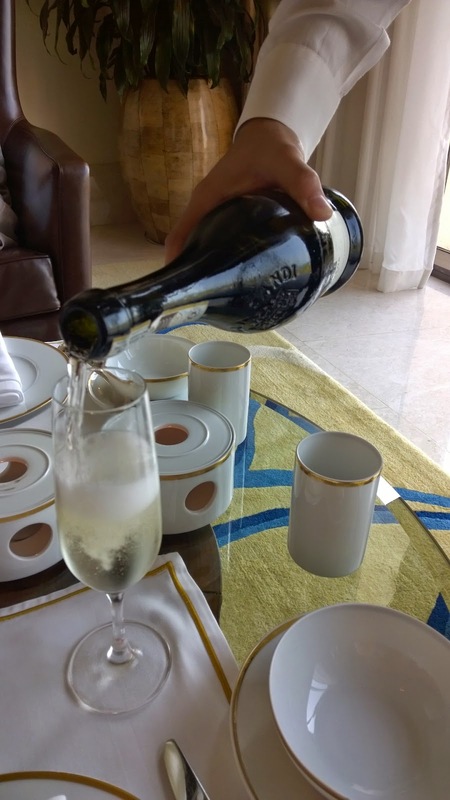 For an added feeling of sophistication, bubbly is an option. Finally, the three-tier stand is brought. Our waitress talks us through the different tiers. I find a lack grace in the her narrative, a bit disappointing because her role is pivotal. She has the power, through evocative and rich descriptions, to make one want to interrupt her and start eating. Passion and soul - these are key. Nonetheless, she finishes and I try the scones immediately. There are two types - plain and with raisins. I am not disappointed. I cut through the plain scone. Effortless and it does not crumble. I try it with Devonshire clotted cream and strawberry artisan jam - good. They are not dry but also not too chewy. A perfect scone. One of the highlights - scones. Next I try something that provides another dimension in colour and taste to the tea set - Air dried beef with cornichon mustard pickles on pumpernickel bread. Rich and intense in flavour. Delicious. In fact, the finger sandwiches are all outstanding. The tomato and cucumber on white bread has a hint of mint on it along with some cream cheese. But very light.The Smoked salmon on soda bread is beautifully presented. Very creative compared to the usual salmon sandwiches. This is more like an open sandwich. Nice. I also love the Brioche quail egg and mayonnaise. It is the lightness of the mayonnaise again. The sweet section does not disappoint either. Courtesy of Sucré Patisserie, the in-house pastry offering, there is a variety of tastes, all beautifully crafted. There is the Crunchy chocolate trio cake, Lemon creme choux and the Milk chocolate hazelnut coffee (similar but lighter than mousse) amongst others. The latter stands out from all the other exceptional offerings. 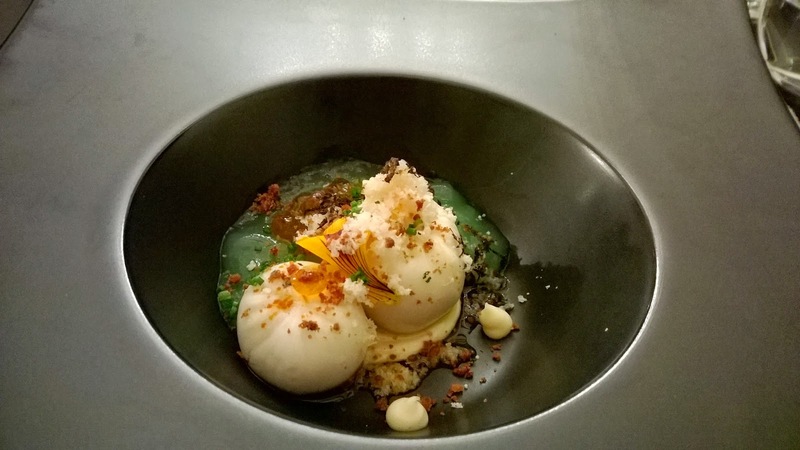 Imagine eating air that tastes like hazelnut - that describes the texture of this. Wow. Briefly, the children's set is more than just a scaled down version of the St Regis set. It contains cookies and al a selection of fresh fruit. 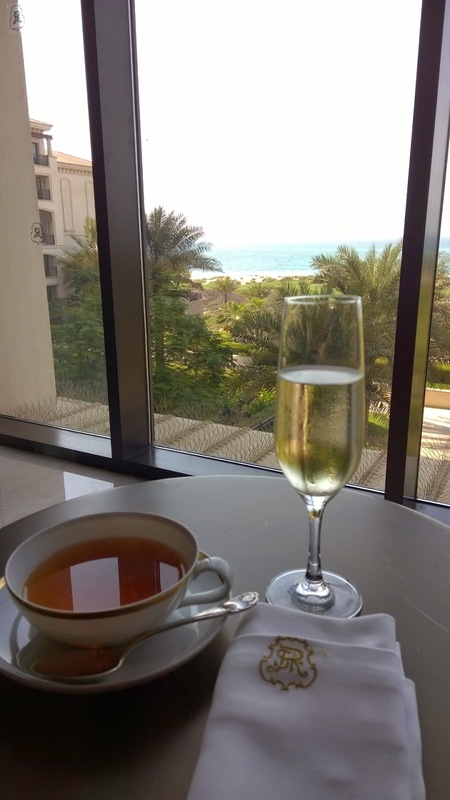 Afternoon Tea at St. Regis Saadiyat was everything I expected it to be, and that is from someone who arrived with high expectations. The experience goes deeper than the the selection of sandwiches or sweets. These, it must be said, are impressive in their own right, but the success of the afternoon is collective. The knowledge that you are part of something traditional, at a time in life where many traditional things are eschewed and innovation at all costs is sought makes it worthwhile. Then, there is the view that is in itself priceless. 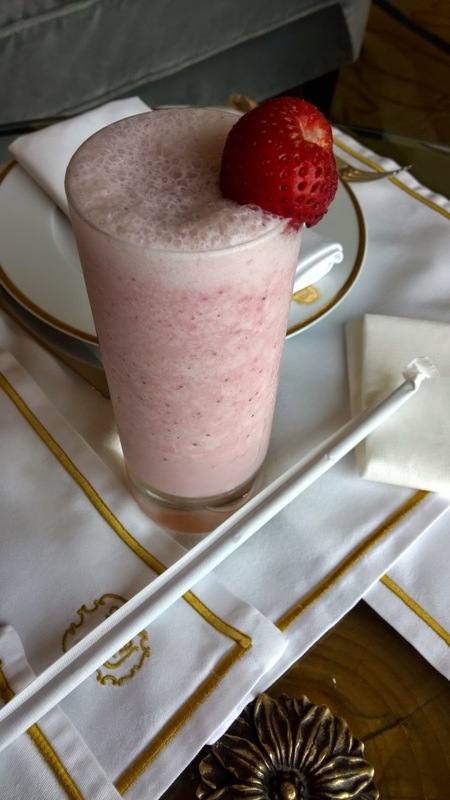 Add to this the St. Regis professional touch and service and you have quite a stellar afternoon.